For easy transport and distribution most consumer goods are now palletised. Enterprise Tondelli can palletise a wide variety of products. Depending on the line configuration, speed required, space available Enterprise Tondelli will supply either low or high level palletisers. Generally a low level palletiser has the advantage of easier operator access but involve more machine movement. This also has an impact on the speed. The high level machine tends to occupy less space and in some respects is simpler but it depends also on the line configuration. 30 layers per hour or around 10 packs per minute would be a low level semi automatic machine. In this instance the pallet is placed by the operator on the floor and removed once loaded. This is very useful for saving labour costs, elimination of potential of health hazard and potential increase in line efficiency and better stacking. Pallet conveyor system and accessories can be added to make this a fully automatic machine if required. 660 layer per hour or 11 layers per minute on a high level in-line feed machine for canned shrinkwrapped trays of products. Obviously at these speeds manual palletising is not an option. Dividing basket type head with rollers. This has double benefit of depositing the packs into the centre of the pallet giving a compact and vertical pallet. This is typically used for shrinkwrapped packs or cartons. Double deck palletiser with one head palletising two different products on two different pallets at the same time. This was for a water factory with two filling lines running at around 20 packs per minute each line. 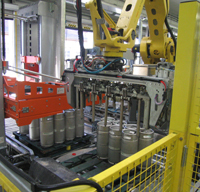 Robot palletiser with magnetic head for palletising bright cans as a buffer for a pet food can factory. 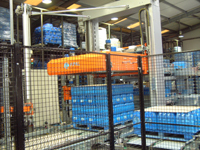 High level pack palletiser for eleven layers per minute of canned products. Whatever your requirement Enterprise Tondelli supply the solution include the conveyor fed system if required.